Engineering Johnson: ...or are you glad to see me? If you've turned on your television lately then you've probably noticed that the Chia Pet and George Foreman grill commercials are back. That can only mean one thing; it's holiday shopping season. If everyone on your list already has a salad shooter and you don't want a repeat of the sock and sweater debacle of last Christmas then here's another option. 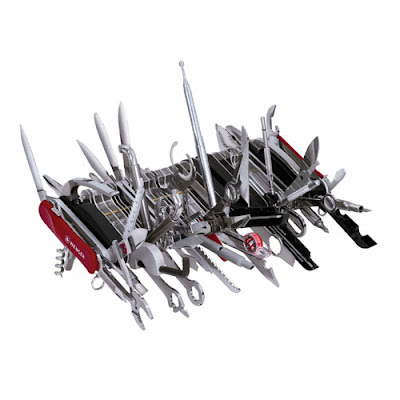 The Wenger Giant Swiss Army Knife (TM). Now I like pocketknives, and I frequently carry a Swiss Army Knife (usually have a Victorinox) but this is hardly describable as a pocketknife. With 85 implements the knife (if you can even call it that) measures almost 9" wide, and I doubt you could comfortably fit it into a pocket. Basically, it is all of the Swiss Army knife tools shoved between two red scales, and while many of the tools are quite useful in certain situations, it's ridiculous to have them on the same knife. Really, how many times do you need to have a golf shoe spike wrench, a 12/20 gauge choke tube tool, bike chain rivet tool, and a watch case opening tool all at once? Still, if you absolutely insist upon having the biggest Swiss Army Knife around you can get one of these for $1200...if you can find one. The Wenger website says they're out of stock. Apparently some people actually are willing to spend twelve hundred bucks on a pocketknife that's too big to carry and too unwieldy to use.